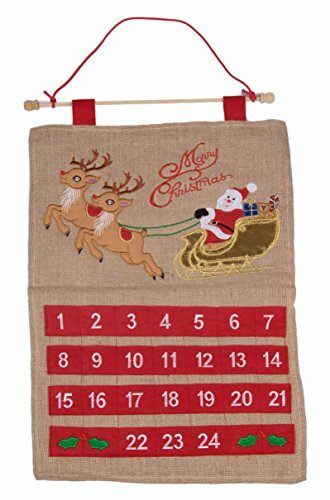 • Perfect for hanging on walls, above fireplaces, and more, this advent calendar measures 14.75" x 21.75". • Please note that for your own safety this product should never be near any open flame or heat source. GREAT HOLIDAY DESIGN: This Christmas advent calendar features a great classic Christmas design of Santa Claus smiling on his sleigh being pulled by reindeer. No matter what your decoration style, this advent calendar is sure to fit in perfectly! COUNT DOWN THE DAYS: Count down the days until Christmas day with the numbered pockets on this advent calendar. You can put small candies, toys, or even special messages into the pockets so that every day you count down you get something special!